Hank Gilpin, photograph by Scott Lapham. Hank Gilpin enrolled at the Rhode Island School of Design to do graduate work in photojournalism after serving as a photojournalist in Vietnam. 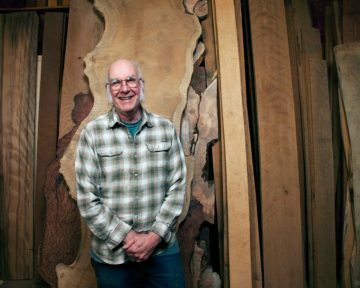 He instead discovered the joy of woodworking under the influence of instructor Tage Frid, who convinced Gilpin to enter the world of studio furniture. 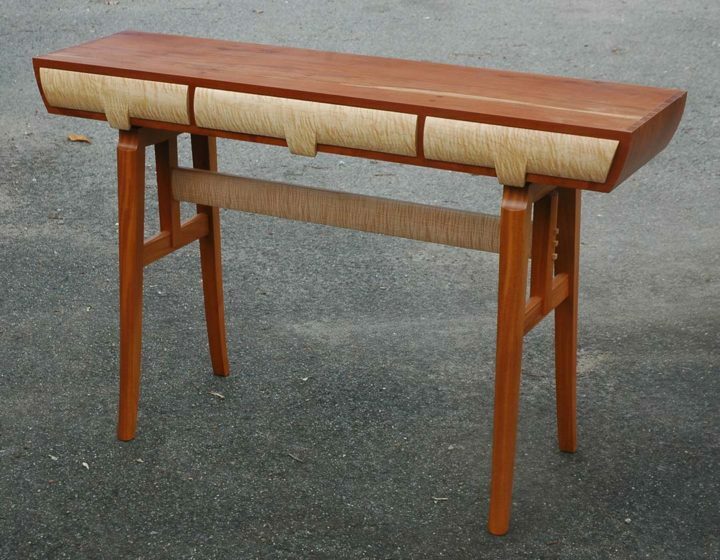 After apprenticing with Frid, Gilpin established his shop in Lincoln, Rhode Island, where he has built a business of fine furniture design and achieved great respect for his knowledge of wood technology and historical furniture. Gilpin’s love for domestic woods is inherent in his creative process. As well as using exotic and high quality woods like redwood and ebony, he loves what is considered waste or low quality woods such as pallet wood. Gilpin has made pieces for clients throughout the United States and exhibited his work in museum and gallery exhibitions. South Florida mahogany and curly sugar maple, 34 x 60 x 16 in.